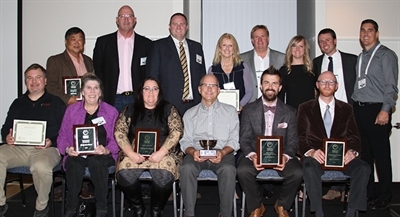 Oregon's nursery and greenhouse industry leaders and servants were recognized at the annual OAN President's Awards Banquet held during OAN Convention on October 27, 2018, at Eagle Crest Resort in Redmond. Honorary Life Memberships went two individuals, recognizing their lifetime service to the nursery industry. Cindy Lou Pease of Evans Farms in Oregon City, Oregon, was recognized for her friendly, outspoken support for the nursery and greenhouse industry. Her expertise for growing and identifying plants is recognized throughout the association, and she is an inspiration for women in the industry. Rod Park has owned and operated Park's Nursery in Gresham, Oregon for 38 years. The nursery was started by his grandfather in 1947. He is a valued member of the OAN, serving as president in 1991 and serving as a longtime member of the Government Relations Committee. Rod served two four-year terms as a member of the State Board of Agriculture in 1992 and 1996, holding positions of vice chair and chair. He also served as a member of the Metro Council from 1999–2011. The OAN Outstanding Service Award went to Dave Van Essen, owner of Van Essen Nursery, Lebanon, Oregon, in recognition of outstanding long-term service to the industry and association. He continuously leaves a positive impression of American growers with international businesses as far away as China and Italy, creating new business opportunities for nursery and greenhouse products for everyone. Dave served as OAN president in 2007 and played a supporting role to the nominating and Farwest Show committees. The Distinguished Education Award went to Ryan Contreras, to honor his exceptional service through education, extension or government service. Dr. Ryan Contrares is an Associate Professor of Horticulture at Oregon State University and director of the Ornamental Plant Breeding Program. He is a critical partner for the industry, having already helped improved 25 genera of woody plants for traits such as disease resistance, habit, fragrance, reduced fertility and much more. The Outstanding Stewardship Award went to John Maurer, Evergreen Growers Supply Inc., for demonstrating a long-term stewardship of water, land and other natural resources. He received this award for his integral role in helping growers cease from being dependent on insecticides by helping to develop a comprehensive Integrated Pest Management program. John has been a committed volunteer to the association and member of OAN board leadership. The Distinguished Member of the Horticultural Allied Trades Award went to Bill Phillips of Phillips' Soil Products Inc., who has supported events such as the Farwest Show, Oregon Ag Fest, and the Yard, Garden & Patio Show for two decades. The award recognizes an allied trade member who has shown exemplary support for the OAN, the industry and our members, and Bill received the award for his generous donations of soil and bark for exhibitor's displays. The Retailer of the Year Award went to Bauman's Farm & Garden, a multi-generational family-owned farm tourism and nursery business in Gervais, Oregon. The award honors the company's strength and innovation as a retailer. Bauman's Farm & Garden have made an impressive effort to improve their storefront and expand their growing operations to provide more products to customers. They have also built an extensive portfolio of unique festivals, classes and events to delight customers. The Chapter of the Year Award was given to the Willamette Chapter, which represents growers in the Salem, Oregon area. The award is given to a committee or chapter that is particularly successful in service to the OAN membership. The award recognizes the chapter's commitment to the industry, including providing funding to the Chemeketa Community College horticultural program, offering educational presentations at chapter meetings, and participating in events such as Ag Fest and various plant sales. The New Nursery Professional of the Year recognition, sponsored by Northwest Farm Credit Services, went to Scott Ekstrom of Ekstrom Nursery Inc. The award honors a person relatively new to the nursery trade who demonstrates outstanding service to the OAN and the industry. Scott has raised the bar for many growers with new ideas and initiatives, including doubling the capacity of his father's container yard production, bringing members of the Mount Hood Chapter together, and helping develop the Mount Hood Chapter map app.